Soft tissue sarcomas account for 7% of childhood cancers, with just over 100 children diagnosed every year in the UK. Rhabdomyosarcoma is the most common type of soft tissue sarcoma, accounting for just over half of all cases. Rhabdomyosarcoma can occur in almost any part of the body but is most common in the head and neck. Sarcomas are rare types of cancer that develop in the supporting tissues of the body, such as bone, muscle or cartilage. Soft tissue sarcomas can develop in muscle, fat, blood vessels, or in any of the other tissues that support, surround and protect the organs of the body. More than half of all soft tissue sarcomas diagnosed in childhood are rhabdomyosarcoma. Other types of soft tissue sarcoma include fibrosarcoma, malignant peripheral nerve sheath tumours, peripheral primitive neuroectodermal tumours (pPNETs), Kaposi sarcoma and Ewing and Askin tumours of soft tissue. Bone sarcomas can develop in any of the bones of the skeleton. The two most common types of bone sarcoma in children are osteosarcoma and Ewing sarcoma. RMS is the most common type of soft tissue sarcoma to occur in childhood. It arises in muscle or fibrous tissue and can occur in almost any part of the body. The most common sites are around the head and neck, the bladder or the testes. Sometimes tumours may be found in a muscle or a limb, in the chest, or in the abdominal wall. Occasionally, if the tumour is in the head or neck region, it can spread into the brain or the fluid around the spinal cord. Nearly two thirds of RMS are of the embryonal sub-type (arising in primitive muscle cells). The other third are of the more aggressive alveolar sub-type. The causes of RMS are unknown although children with certain rare genetic disorders, such as Li Fraumeni syndrome, have a higher risk of developing RMS. RMS is the most common type of soft tissue sarcoma to occur in childhood, accounting for 53 per cent of cases (and four per cent of all childhood cancers). There are up to 60 new cases a year in the UK. Incidence is greatest in children under the age of 10 years. The age distribution is different for boys and girls. In boys incidence peaks at age 3-4 years. In girls, it peaks earlier at 1-2 years and then declines. It is more common in boys. The five year survival rate for childhood RMS is 71%. Age is an important prognostic factor. Children diagnosed at the age of 10-14 years have lower survival, around 50%, than children diagnosed at a younger age. The overall survival rate for other types of soft tissue sarcoma is the same as RMS, at 71%, but the age pattern is different – with diagnosis during infancy being associated with a low survival rate. Other important prognostic factors are the site, size, type of RMS, whether it has spread, associated genetic changes, whether complete removal is possible and general health of the child. Symptoms of soft tissue sarcomas depend on the part of the body affected. The most common sign is a swelling or lump. If the tumour is in the head area, it can sometimes cause a blockage and a discharge from the nose. Occasionally an eye may appear swollen and protruding. If the tumour is in the abdomen, the child may have discomfort in the abdomen and difficulty going to the toilet. If the tumour is in the bladder, the child may also have blood in the urine. A variety of tests and investigations may be carried out to diagnose a soft tissue sarcoma. Blood and bone marrow tests will be taken. A biopsy is usually taken so the tumour cells can be examined under the microscope. Imaging techniques – including X-ray and ultrasound, CT or MRI scans – will be used to determine the exact size and location of the tumour and whether it has spread to other parts of the body. Then the cancer can be staged, guiding treatment. Before treatment commences, doctors will stage the tumour. This is a complex classification based on the site of the original tumour, its size, whether lymph nodes are involved, whether spread has occurred and the histology. This then guides decisions about treatment. A combination of chemotherapy, radiotherapy and surgery is likely to be used. Sometimes it will not be possible to remove the tumour by surgery either because it is too large, inaccessible or because it has spread to other parts of the body. In these cases, treatment is likely to involve a combination of chemotherapy and radiotherapy. High dose chemotherapy may be required, predominantly in patients with relapsed disease, necessitating stem cell rescue to restore damaged bone marrow. The benefit of chemotherapy is firmly established for RMS but not for other types of soft tissue sarcoma; surgery is considered the mainstay of treatment for children with these tumours. Surgery and radiotherapy may both cause functional or cosmetic problems depending on the area of the body in which the tumour occurred. Chemotherapy may cause problems with heart and kidney function, fertility problems and a small increase in risk of developing another cancer. The treatment and prognosis for relapsed RMS will depend on the site of relapse, whether there was previous radiotherapy, the original size at diagnosis, and the time to relapse. 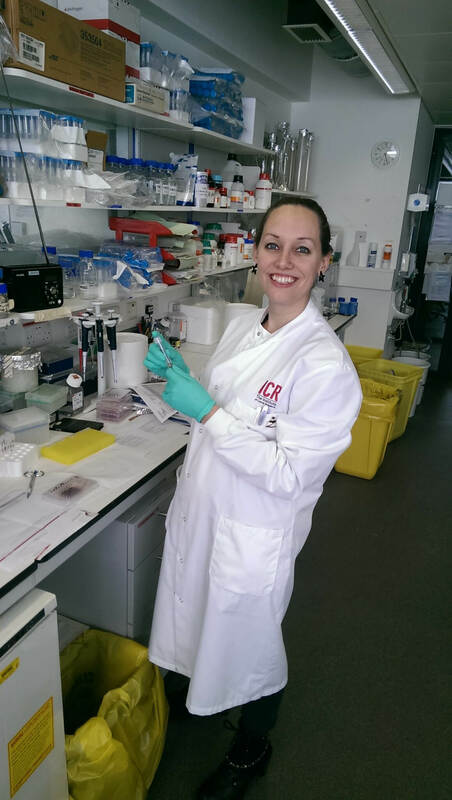 Children with Cancer UK is funding a number of research projects focused on rhabdomyosarcoma. Read Krystal’s victory against rhabdomyosarcoma, told by her mum, Rebecca. 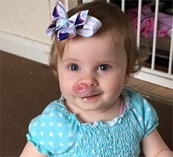 “A small red mark appeared above her lip and the GP initially treated her for an infection. We used creams and were given antibiotics, but it started spreading and getting bigger. After three long months of different antibiotics and creams and different doctors looking at her we went to the Ear, Nose and Throat Unit. As soon as the doctor had seen her he booked a biopsy to have a small piece of the lump removed for testing. A week later the results were in and we were taken to a small room. I’ll never forget that day. They said: “I’m sorry, but your daughter has cancer: rhabdomyosarcoma”. So many questions race around your head. Will she die? Will her hair fall out? How likely is it the chemo will work? But I had to stay strong for her. And Krystal, no matter what, was always smiling. She had intense chemo every three weeks for three days – six doses at once. It was tough, but she was tougher. Her hair had fallen out after the first two weeks and in the first eight months we were only home for around 12 days. 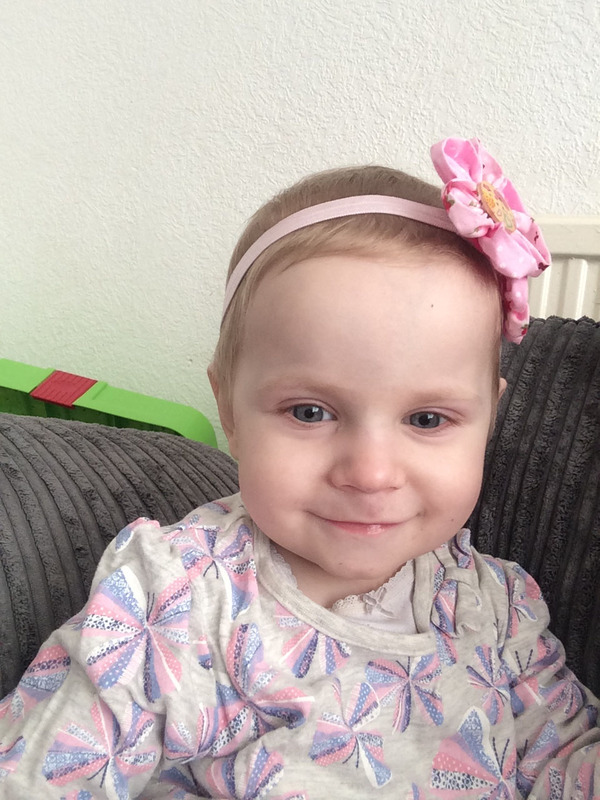 Krystal’s rhabdomyosarcoma tumour on her upper lip had spread to her lymph nodes in her neck and we were told she also needed radiotherapy. She had this in the adult hospital at the Clatterbridge Cancer Centre and had a total of 28 sessions to her face and neck. Krystal still had her chemo in between the radiotherapy. You wouldn’t think they could do so much on a little baby. Her strength was amazing. Three months later we had an MRI scan to see if the eight months of chemo and radiotherapy had worked. The results came back showing just a small shadow on the scan with no active cancer growing. I cried happy tears that day. 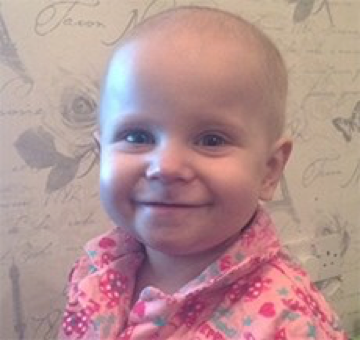 Krystal started maintenance chemotherapy in October 2014, having been diagnosed in March 2014. This involves a small amount of chemo through her central line every week, and oral chemo every night. It lasted a year, and finished in October 2015. 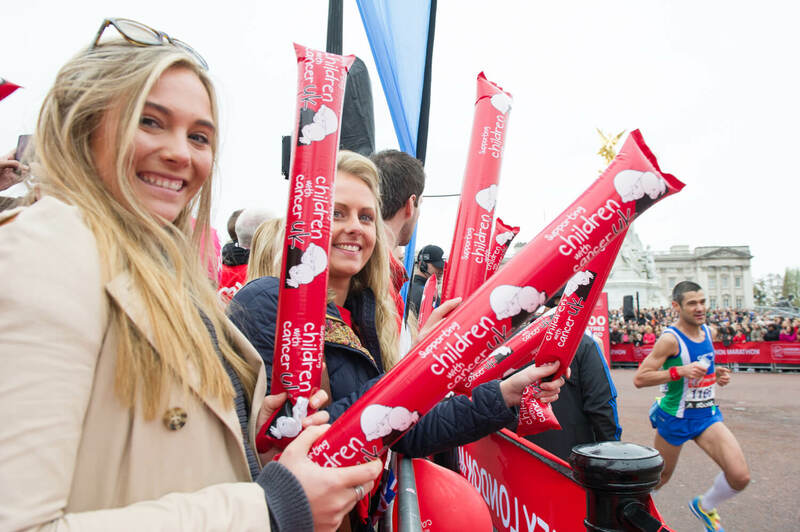 If you’ve been touched by Krystal’s journey, help us invest in the high quality research which would otherwise go unfunded, helping to support children with cancer so they can be with their families for longer.